For any modellers who are planning to set their railway into a landscape, I can explain the sequence and some of the safeguards that I use to start the ball rolling. Before we get involved with scales and gauges though, let’s just take a quick step away from the railway for a minute, and remind ourselves of how we actually percieve the world around us, because it will determine how we approach the task on our return. A 3D layered backscene with a low sun skyline and a combination of man made and natural features in a relief landscape. The clouds are airbrushed and are naturally lit from the underside. We ‘see’ within two intersecting cones of vision and the inverted images coming into our retinas are instantly converted into one real time moving image. An added perception of depth comes in from a sub-conscious process of triangulation between the two slightly different retinal images, and either nearer or further objects of interest are then selectively focused on by our eyes as a matching pair of lenses. We then automatically interpret these images in the visual cortex of our brain, and we can either swivel our eyes in their sockets for a fixed viewpoint, or move our heads and bodies to look further around us giving a moving viewpoint. Because our vision is interpreted, we can fool it by feeding it false information in the form of illusion, either fooling the sense into detecting something that doesn’t really exist, or into ignoring something that does. The particular deception that we are after in this case is to imply distance, so we can cheat by displaying some of those familiar triggers that the mind is accustomed to when percieving real distance. Long ago the French called it Trompe l’oeil, but it’s really a trick of the mind rather than the eye. We instinctively recognise images regardless of their real dimensions, much like the inhabitants of the animal world, where predator or prey survive by a making a judgement of distance based on relatively larger or smaller outlines. Distances and surface textures can be judged by studying the effect of foreshortening, As humans we can not only observe these effects of perception, we can also reproduce them as familiar triggers for others to view in the form of an illusion. Including smaller scaled features helps the illusion along. The trees are only just behind the locomotive, but because they are made relatively smaller and with less colour intensity it helps them appear to be further away. This follows the observation of the landscape painter, who is not encumbered by any scale at all and studies what he sees instead. We know that each blade of grass, tree and locomotive exists in life’s scale within the landscape of the real world, and we can establish their actual sizes by measurement, then reduce them to the scale of our model. 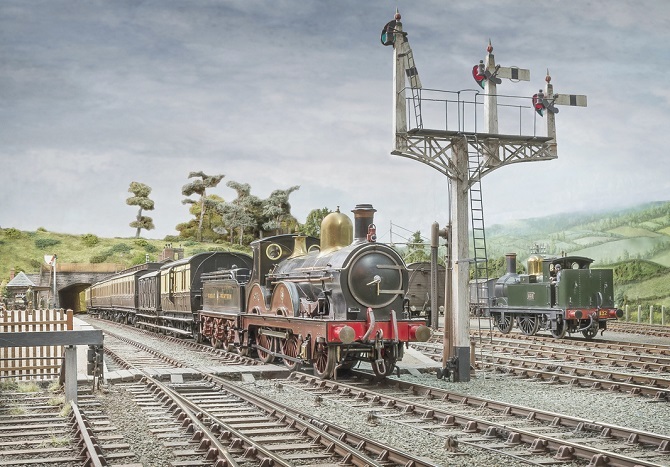 Because we don’t ‘see‘ anything in scale though, (including our model), we can present a layout environment using similar observations to a landscape painter or photographer who has no need or concept of scale. They only seek to capture what they percieve in 3D and then represent part of it in 2D within a framed window for others to view. A painting or a sculpture need serve no purpose other than to stand alone and uncompromised as pure expression, but an illustration, or a backscene in our case, need only serve a secondary visual purpose, providing a context of location. As soon as it is included into an assembly of other elements like a layout model, it ceases to be the only focus and contributes instead to the overall realism of the display. A landscape picture simulates a view from a static position then, but without any sides to its frame, we could look right around us as we do in a real landscape, rotating through 360 degrees progressively viewing a panorama. 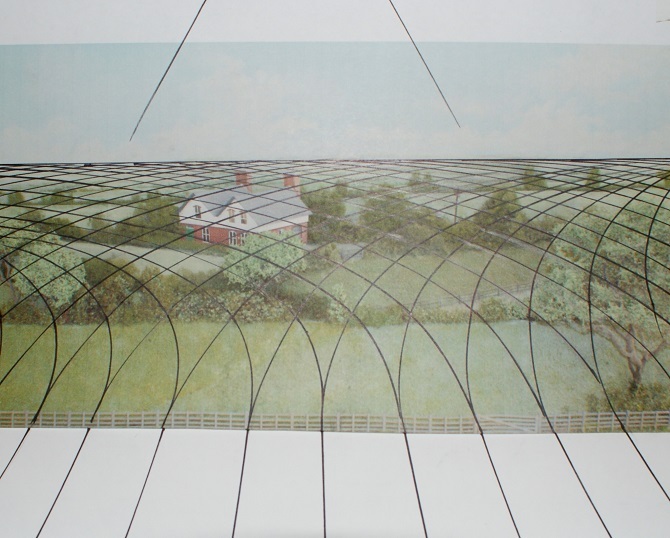 If we allow a partial panorama we would percieve a diorama, so the width and configuration of the frame determines the extent of viewable landscape. It can be rightly pointed out that a flat backscene can accentuate the fact that there is only one plausible viewpoint. A flat image becomes less and less successful as an illusion when moving away from an eye level view at a right angle. 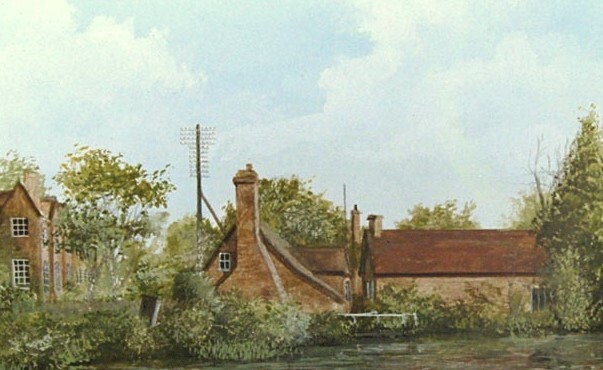 This is acceptable with a painting because in a busy gallery, no one ever criticises a canvas for being unrealistic when viewed at an oblique angle, they accept that the image is foreshortened and wait to get a better viewpoint, the same applies to watching any flat mediums like printed images or TV screens. This 2D section has no difficult perspective or depth of field, and with a restricted viewpoint and some view blockers either side, the effect of unrealistic foreshortening could be avoided. Because our images accompany models, this normal tolerance is withdrawn, so it is correct to observe this as a problem. We really don’t want to do a huge amount of detail work, only to find it has not produced a convincing illusion as a reward. 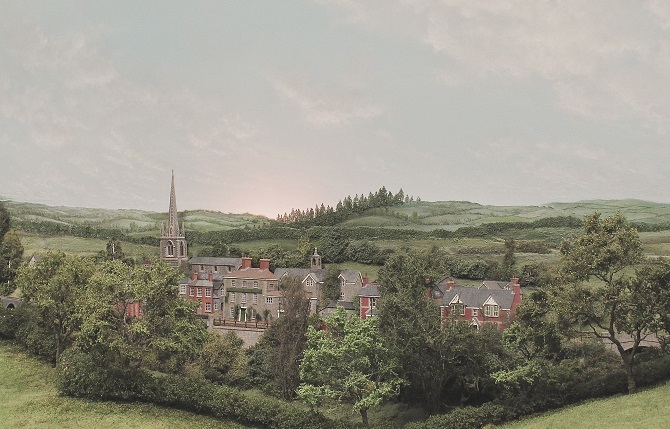 A backscene panel arranged as a partial panorama will help to maintain a less distorted aspect, minimising vertical foreshortening. It’s possible to offset a few of these inevitable compromises by creating our landscapes in partial 3D and sometimes also to use devices and additions to obscure a sight line into any unrealistic areas of distortion, these are sometimes referred to as view blockers, but we as modellers also have the ability to blend our landscapes from two into three dimensions by graduating out from a flat image into a three dimensional miniature, so a large proportion of a 3D backscene is an exercise in relief modelling, rather than painting. 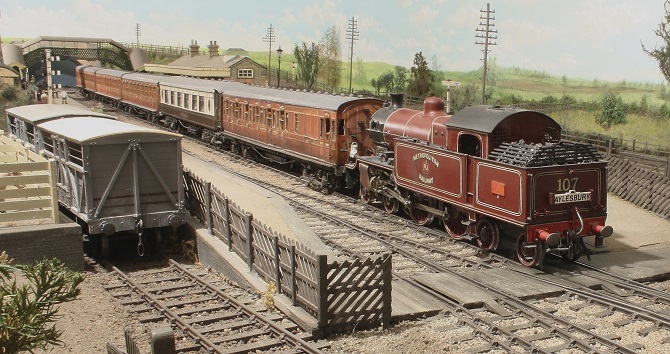 This rear panel goes round in a curve behind the footbridge on the left, travelling through 90 degrees, with the largest possible radius helping to make an extended diorama out of this end of the model. A similar curve finishes the right hand end of the scenic section, giving nearly 180 degrees of vision. Always try to arrange the gentlest panel curves at the planning stage, because no backscene or diorama is ever without some compromise, but the less the better. Natural history dioramas begin their illusions at life size to portray animals in a typical habitat, with any background elements appearing to recede into perspective. 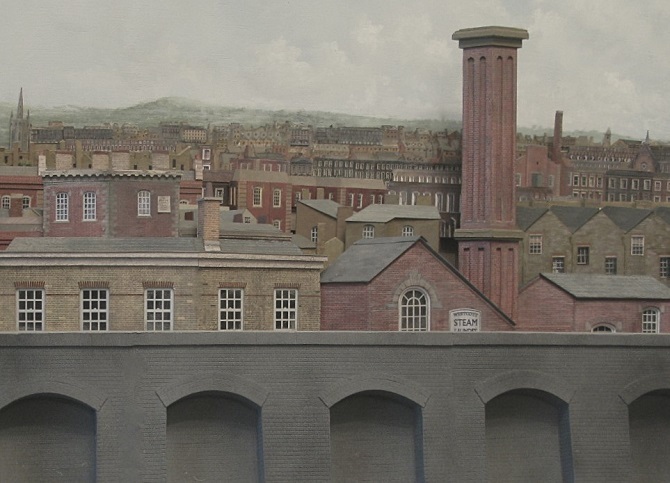 We can create similar 3D illusions, but the difference is that our landscapes must have a ruling maximum scale corresponding to the natural focal point which is the modelled railway occupying the foreground. From this ruling scale then, we can adapt the drawing convention of perspective to work out how much to reduce the distant objects, and even though we don’t really see anything in straight lines and vanishing points, (remember our information comes in through lenses), unlike scale it can help us to arrange a convincing illusion of distance. The more physical depth that is allowed for this, the more effective the illusion will be. 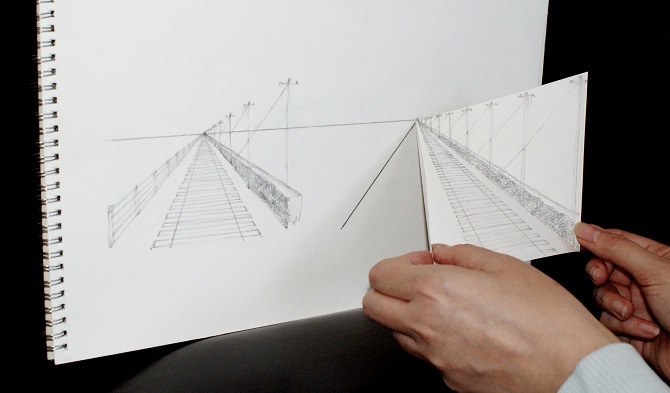 Above is a perspective doodle with crude set of rails, a fence and a row of poles disappearing at a single vanishing point on the horizon line. Alongside is a 3D doodle, where two of the lines have been picked up off the page, and lifted out into glorious 3D. This is the beginning of a forced perspective grid and it is very simple indeed. The two lines have now been replaced with an equivalent forced perspective doodle with planes as well as grid lines, so we can see a basic one point forced grid in position. The vanishing point is artificial and as such, it comes with some viewing compromises. Any perspective has its horizon line as the most important datum, as it determines the elevation of any vanishing points that may be present along its length so let us now return to the railway and see how much of this can be applied to the backscene. 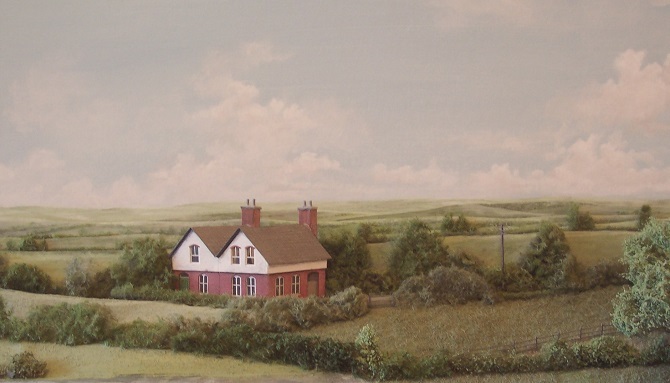 As an element in this landscape, the cottage has two vanishing points along a hidden horizon line datum, one for each aspect so this scene is made in a two point forced grid. Each layout will require a different horizon line and a following grid to the next because of height variables like preferred viewing position, baseboard height, and so on. In practical terms, then we must deal with any panel height restrictions and also assess the amount of available room behind. Incidentally, if you are at the design stage of a scenic layout, then it’s a good opportunity to plan the backscene as part of the overall design rather than adapting something onto an existing layout, either way always be sure allow the absolute maximum amount of depth (for graduating from 2 to 3D), and the maximum workable height for the rear panel as well. Even if it means moving the entire layout, or relocating rails that are too close to the back, it will pay you back in overall effect in the long run. With the panel height established and the furthest depth also attained, we can now look at the best compromise for the horizon line and one way to visualise this is to imagine the layout as though it is placed in a flat level desert. Position yourself at your chosen viewing height, either sitting or standing usually, and picture a levelled desert type horizon onto the rear panel closest to eye level. Because of the forced nature of the horizon, it cannot be made to behave as a distant one, and it will therefore only appear correctly from one fixed elevation height. Each layout will respond differently, but a backscene can be plotted out if necessary as a mock up, positioned in situ on a sheet of thick paper or thin ticket card conforming to the available space and height. This can form the beginning of an outline sketch that can be worked into from reference material. So while in position on the layout, begin by pencilling the horizon line level all the way round. In many cases, the requirement will be for a background scene depicting what would have been visible from a position overlooking the lines at a certain time in history, or a specific window into the past so to speak. There are several sources of information that can be consulted to start putting the puzzle together, and the first piece can be an Ordnance Survey map of the surroundings from the chosen period. With an established set of heights for rail level, view height and horizon, we can then get to grips with both the forced perspective and the scale contours of the chosen landscape. By measuring from your viewing eye level down to the rails, then converting it to layout scale, you can now express your elevation relative to the line height. 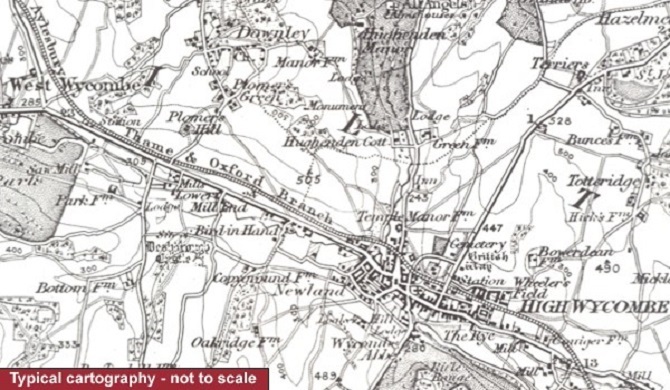 With a contoured map, you can then establish the line’s height above sea level and by adding your own elevation to this, you will have measured your view height relative to the land surfaces and the focal point of the railway itself. The topography can then be described by profiling from the map, firstly at layout scale, then moving away into perspective. 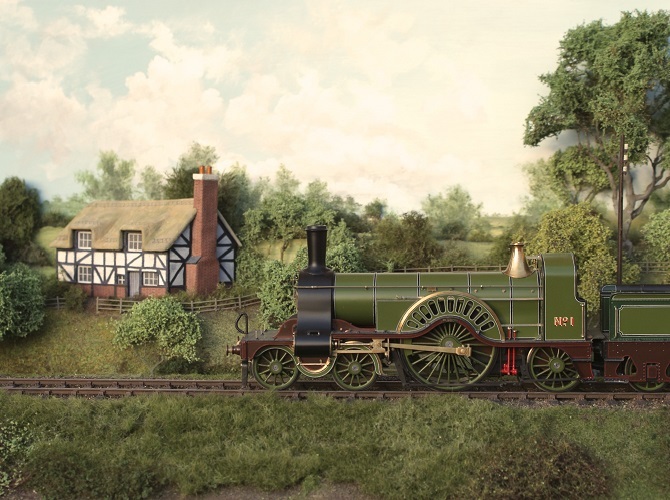 The concept of a separate backscene is really outmoded nowadays because the high standards of todays more studied scenic models quite rightly warrant a complete environment instead. A uniformity of appearance between fore and background like the real world is the effect that we seek to create a believable context for the model. This can be achieved by presenting the surroundings using the same visual language as the layout in terms of attention to detail, textures and colour palette. Producing a highly detailed strip of railway land with incredible finescale accuracy but then applying a differing broad brush approach to the remaining landscape often creates a problem. Instead of becoming uninteresting to the eye, the discord between the two visual languages on the same presentation can sometimes highlight the difference between the model and its surroundings, attracting attention rather than deflecting it. 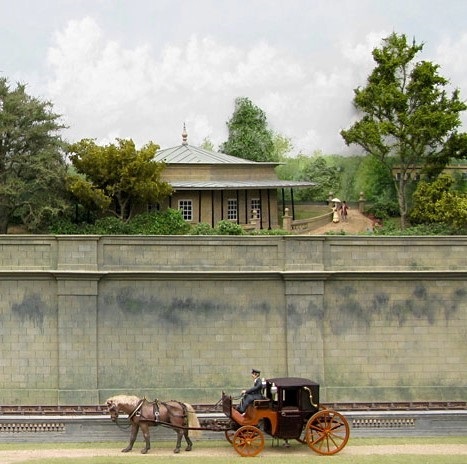 The first glimpse of a specific location can now be surveyed by positioning the map horizontally at viewing height within the diorama, and taking an overview with the size of the railway on the map corresponding to that of the layout. Looking across the surface towards your pencilled horizon line, it shows what was once present, like building outlines, crossroads and other labelled landmarks, and you now have the beginnings of what would have been visible but at this stage only in horizontal 2D like a plan view. The skyline features can be plotted out using the same principle as the immediate locality, but by using a combination of smaller scale maps and photographic reference. Even in relatively featureless environments like this, an OS map can still be a useful plotting tool to represent directions, borders, woodland, field sizes and hedgerow detail as well. From your viewpoint, the first obvious landmarks can be projected onto the rear panel just as labelled sketches, and to help start the process, you can always get the first row of visible features directly behind the lines blown up to layout scale and arrange their footprints like a sort of backscene templot plan. Behind the first row, the layout scale is discarded altogether and distance perception helps to take the surroundings away towards an artificial skyline. Each feature and its perspective angles will eventually rise and fall relative to the line height according to their contour, but sketching their position roughly will do to start the process. 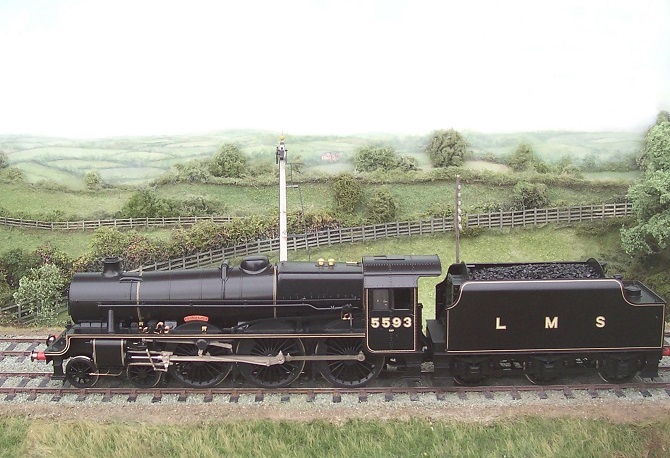 Look over the railway to plot the details and landmarks beyond from a low viewpoint like this. Features that have been removed in the past can now be re-plotted back into their previous positions from the correct aspect of the viewer, include them in the sketch to start with as a position guide and constantly refer back to the old photos and the map. Continue adding the landscape features onto the sketch until it starts to fill up with information. Trees can be represented by a simple outline trace to start with as well as buildings, the detailing can follow later on. Even with the best dioramas the viewpoint always changes a bit as it moves around so it often becomes necessary to make some adjustments, moving elements around until they sit comfortably with one another. Forced perspective is useful but it is a compromise, so even with the most generous allowance of space, a bit of adjustment here and there is part of the job. 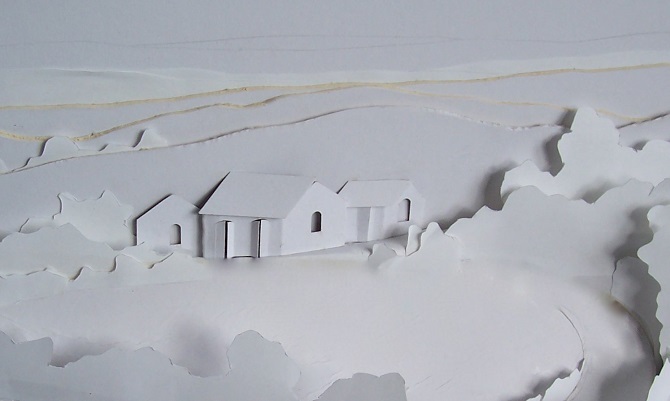 Semi relief features in the near distance can now be represented by cut and folded mockups at this stage, and this isn’t restricted to buildings, they could be trees, hedgerows, telegraph poles, or any prominent feature at all. Any layering of the scene adds to the overall illusion of depth, a bit like one of those pop up greeting cards. If needs be, take some reference photos from the site trip and re-size them by photocopier or computer to fit the sketch, then trace or cut them out. The next step, is to source as many images as possible to describe the appearance of the specific locality, again ideally from the correct period. This stage of research can never yield a perfect set of colour images of every subject without any information gaps, but the main thing is to keep looking for this vital resource, a combination of inputs from books, postcards, archived pictures and of course any maps. Most of what you find or photograph yourself will have been recorded from a completely different scale elevation from the one you have chosen and this causes all sorts of problems. It’s still valuable information, but it just means we can’t use it as it is because railway model viewpoints tend to survey an entire scene from an unrealistically lofty perch. In contrast, the recorded reference will usually take the form of a set of photographs taken from the height of a scale figure. This discrepancy can be addressed once it is understood but it does affect the way we must gather the vital reference because the entire perspective grid (or everything in the surroundings) must be re-configured with each change of view height. With a low enough viewpoint, even a tiny foreground object can obscure your sight line of a much larger distant object. From a higher elevation the same tiny object can become practically invisible. In short then, as far as backscenes are concerned, the higher you are relatively, the further you can see. If I were standing by the arches in the foreground, I might only see the chimney and the top of the wall breaking my skyline as a single focal layer when I look up. Because I am well above the line height with quite a low baseboard, I can see over a greater distance and the skyline isn’t broken nearby anymore. Backscene buildings have no recognised scale, they only appear in the landscape relative to the other elements and their perspective grid, so they conform to the reference, rather than dictating it. As the research progresses, you find yourself becoming progressively more familiar with the surroundings of the location. The inevitable and frustrating information ‘gaps’ become apparent during the quest for historical data as well This researching process, and its ups and downs will already be familiar to anyone who has produced a prototypical layout, and much in the same way, the solution to fill in the blanks must sometimes take the form of an educated guess, personally I prefer to keep this to an absolute minimum. The study area now wanders away from the railway company’s boundary fence and enters the local history archives, some of which can be found recorded, so we can jump in the car and visit the location with all the reference so far and a camera, to see what remains in situ, and document everything relevant. Combine this with an appointment to visit any archived collections, and of course allow enough time for a decent pub lunch as a reward for being virtuous and taking up the challenge! To anticipate any atmosphere you may want to suggest in the finished work, try to pick a day where the conditions and lighting approximate the feel you are after, (not easy in this climate!) There’s no such thing as too much reference when it comes to this kind of work, and it is a vital part of the success of the final outcome. As far as possible, find the closest position to the layout viewing position, and if you’re on high enough ground, move away from the direct lineside and take a series of overlapping portrait photos forming a panorama including the horizon line. Zoom the camera into any surviving landscape features and record every detail. If necessary, travel around within the locality, taking detail views for future study at the rendering stage of the project. 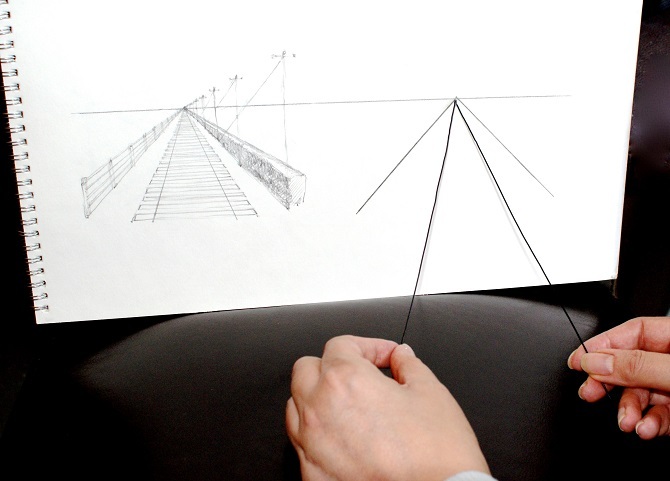 This is a mock-up panel and it shows a simple two point forced perspective. (The two vanishing points can be seen on the horizon line in the inset detail) In between the relief building, and the skyline, a number of horizontally aligned field boundaries are represented in ever decreasing layers. Our perception of depth is generated by a sub-conscious comparison between the two slightly different views in each retina image. It is therefore extremely effective at close range, becoming less so in proportion to the studied distance. If the far distance can be seen without obstruction in our cone of vision, we must percieve it as a flat image, because the two long sides of the detection triangle are too similar to register sufficiently different images. In other words, your eyes are too close together, and so are mine, and this actually goes some way to help us with our illusion of depth in the same way that we don’t find it unfamiliar to study a landscape on canvas. Arranging a flat rear panel is well within our grasp as well, and so is progressively increasing the focal layers that we observe with increased depth as they get closer by. I use elliptical guidelines that help make the transition between layout perspective and forced horizons. These gradually introduce recession without snapping the grid from one plane to another. The real layout perspective disappears offstage at the top so to speak, and can’t be used so this helps to blend the landscape gently in. As the intersections between the guides recede into the distance they draw progressively closer together until they all become horizontal. When doing horizons always study the reference with a powerful reading glass, and try to avoid vertical pathways, where landscape features disappear over the far horizon at too steep an angle. A horizontal guide is the one to apply to any composition whatever kind of terrain is required. The reason for this is the phenomenon of foreshortening which prevents the far horizon from displaying any apparent vertical lines. Field lines and other man made features do disappear away from the viewpoint, but they are invisible due to foreshortening, it’s like trying to see a bit of thread when its end on. A number of focal layers lead the eye into the distance , and the retaining wall visually separates the differing relative environments. The background gives an illusion of depth without really occupying any, and unwanted foreshortened views are obscured from the sides. Putting all that collected study material to work, eventually rendering the scene into texture, colour and detail is the next step, and of course it actually becomes far more rewarding than just plotting and organising as it starts to come alive, but it is important to get off on the right foot, and avoid the many pitfalls along the way. Title photograph was taken by Chris Nevard and all others by the author. Thank you so much for a thorough and insightful explanation of the complexities of simple perspective! No, I am not at all being cynical. The approach you have explained and illustrated so helpfully is a masterly adaptation of artistic science to practical railway modelling, and deserves high praise indeed. I have tried to introduce my artistic grand-daughter to the simple rules of perspective, with limited success, but your approach is exemplary.